The Halifax Reader - Halifax Public Libraries: What's new for the barbecue? What's new for the barbecue? We're a couple of months into barbecue season; maybe you're getting a little tired of the same old burgers, hotdogs, and steak and want to try something different. 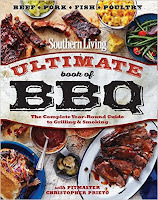 Here's a selection of our newest barbecue cookbooks to keep things lively on your grill. 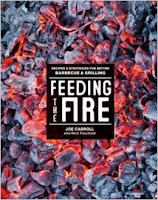 "Joe Carroll makes stellar barbecue and grilled meats in Brooklyn, New York, at his restaurants Fette Sau and St. Anselm. He gives us his top lessons and recipes to make incredible fire-cooked foods at home, proving that you don't need to have fancy equipment or long-held regional traditions to make succulent barbecue and grilled meats... Recipes include Pulled Pork Shoulder, Beef Short Ribs, Bourbon-Brined Center-Cut Pork Chops, Grilled Clams with Garlic Butter, and Charred Long Beans. Anyone can follow these simple and straightforward lessons to become an expert"--Provided by publisher. 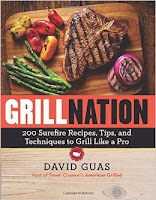 Written by the host of the Travel Channel's "American Grilled" this book provides mouthwatering photos and comprehensive instructions on all aspects of cooking on a grill. Guas outlines the various merits of gas and charcoal barbecues, types of wood to use in smoking food, and a great selection of recipes which include many non-meat dishes. I can't wait to try the Grilled Peach BBQ sauce -yum! A focus on fresh ingredients, sauces, and slow cooking brings a french flair to your backyard. The authors have written several books on barbecue and grilling and have appeared on the Food Network and the DIY Network. 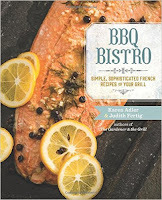 Recipes to try include: Grilled Salmon Benedict, French Feta and Charentais Melon, & Grilled Rib-Eye Steak with Onion Straws. Bon appetit!